FAST, Proven & Effective Neck,Shoulder & Back Pain Therapy Without The Need For Surgery. Discover The Instant and Effective Neck, Shoulder & Back Pain Reliever Device! 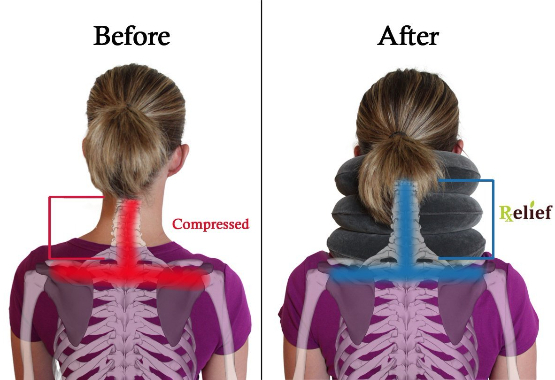 Provides fast neck pain relief, and a faster recovery from neck injuries, without the need for medications or surgery. Relieves neck pain for anyone suffering from neck arthritis, herniated/bulging disc in the neck, neck strains and cervical muscle spasms. Place the device around neck. Use it while at home, at work (great for sitting at the computer!) or travelling. I’ve been using the product for almost a week now, 20 minutes a Day. There is less tension in my neck and it only gets better after each use. I recommend this product if you experience tension headaches or low range of motion due to tightened neck muscles. Excellent Inflatable Neck Support Brace!! My neck pain was temporary, from a car accident, and this device offered effective relief. The pump works great, no leaks, no loss of traction over a normal interval of wearing. Now, I still find it comfortable as a neck pillow while traveling or watching TV (although as a pillow, it seems to work better upside-down). Tip: find a plug (something like a plastic golf tee) & you can detach the tube at its joint near the 'pillow', plug it, and walk around without the dangling tube & bulb, with the pillow still inflated. Also, detaching the tube there allows the wearer to inflate the pillow 90% full, then re-attach & complete pressurizing with the bulb. I've suffered neck problems most my life as I believe it all came from a car accident as a child where back in those days if you could walk away from the accident, you didn't go to the doctor. So, I do believe I had whiplash that was never treated which has caused my negative curve and bulging disk in my neck through years of non-treatment. As an adult I've spent lots of money on therapy, medication and migraine medication as I tend to get migraines from my neck muscle spasms. My father recently was diagnosed with a compression fraction in his lower back and he bought a decompression table that flips you partially up-side-down to allow gravity and your weight to gently separate your spinal discs. He is really enjoying this table so I thought I'd try something similar for my neck to stretch my neck muscles and help relieve the compression and negative curve. I love this thing!!! I put it around my neck, pump it up until I feel my neck is starting to stretch and I feel immediate relief and my migraines have started to lessen. All these years and this little thing is what's gave me the most relief. I use it almost every day for about 10 minutes and it's great relief!! I had the original brand of inflation neck traction and after 4 years it started to leak. I ordered this Inflatable Neck Support Brace to replace it and am very happy I did. I have a small neck, at first I thought it was going to be way too big, but it just took a while to pump it to the size of my neck. It completely relieves a problem I have with a pinched nerve at C7. If you already own one of these try laying down with it on. It adds just that last amount of stretch that takes all the pressure off the neck. It makes an amazing difference. The release valve is a great improvement as well.